And I don’t mean ‘kinda know’. I mean know specifically what you will be eating. People who make great progress, or who maintain a good level of bodyfat, will usually know this, as well as the next day, and the next! They go to the grocery store to buy specific items for the meals they plan on eating. At first, they probably follow a specific shopping list to help them pick the right items so they can combine them in the tasty meals that will fuel their lives, and that they can prepare according to their schedules. We talk about how to create a ‘Food Matrix’ (to help you plan) in our workshops, and we’ll post an article about that soon. The gist of it is that 3 meals a day with a snack works out to (7 days x 4 ‘meals’ = ) 28 times to cook/prepare. If you cook 5 combinations a week, and cook so you get 5-6 servings per combination, you’ll have all of your meals for the entire week! The extreme example of this is to cook all of your food on one day, then pre-package everything for the rest of the week. Most people will budget enough time throughout the week to prepare 3-4 times, and make sure they have enough left overs to carry them over. Now that we have covered how to plan for eating at home, let’s talk about going out to eat. Having a plan for eating out will help you stay on track, while also not looking like a weirdo when you pull out your own packaged food at a restaurant. I define ‘eating out’ as going to a restaurant for dinner, buying lunch at work, stopping by to pick something up on the way home, etc. First and foremost, you need to decide if you are going out to eat for sustenance, or for pleasure. For many people, eating out was a treat growing up. It didn’t happen all of the time, and it meant that you got to eat foods you don’t normally eat. Restaurants naturally cater to this by making their foods as tasty as possible (so you’ll buy more). This is where I came up with the term ‘Appetite of Opportunity’. When faced with tasty foods that you don’t normally eat (that you just paid for), you are likely to eat more than you normally would. You are going to order lots of different things. You are going to eat as much as you can (not as much as you need). You have the ‘opportunity’ to eat lots of yummy food, so you are going to have an ‘appetite’ to match. There is nothing wrong with this on occasion! Eating food should be used as a time to enjoy ourselves and connect with other humans. The problem comes up when we mix up our intent of ‘eating for pleasure’ and ‘eating for sustenance’. If you are dining at restaurants frequently, you need to go with the intent of eating for sustenance most of the time. Select an establishment that has healthy options. Pick the right things on the menu. Only eat what you need and take home the rest. About once per week, or 2-3 times per month, eat with gusto. Enjoy the food and the company you are eating with. Do not stress about the food or how many calories you ate. Order the appetizer and the desert. One “bad” meal in 30 or 40 will not derail your goals! You want your friends to wonder in amazement at your gains while still being someone who can put away so much delicious food! Decide BEFORE if you are eating for sustenance or for pleasure! Location, location, location! Go to an establishment where you can get decent meat and vegetables. Chipotle, Baja Fresh, Steak Houses, Seafood, Whole Foods, or any place with a good omelet. Be picky on the menu. A ‘salad’ may be good, but one loaded with croutons, dressing, candied nuts, etc. and is the size of a manhole cover, is bad. Find something loaded with veggies (REAL veggies and not corn, potatoes, and the like), and a good amount of protein. Change up the order. Get the burrito in a bowl. Get the burger without a bun. Switch the potatoes out for veggies. Ask for fruit instead of toast. Don’t eat the bread/chips they offer for ‘free’. These filler foods actually make you eat more of your entrée! Know your portions. Divvy up your plate before you dive in. Eat slowly, and plan on taking the rest home, leaving it, sharing it, or giving it to someone outside who may need it more than you! 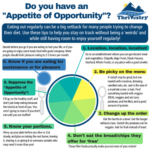 Suppress the “Appetite of Opportunity”! Fill up on the healthy stuff, and don’t just keep eating because the food is in front of you. You aren’t going to starve if you don’t eat until you are stuffed! Side note: Many people believe that eating healthy is expensive. Research says that this is not the case. The reality is that eating healthy food, prepared by someone else for money, can get expensive. If you are looking to save some dough (pun intended), put more time into preparing your own meals. Save the money for ‘going big’ when you are eating for pleasure! I hope this helps you plan for success, while still enabling you to enjoy life’s pleasures. While it is okay to stretch our willpower for short periods of time, it is much more important to build habits that take us where we want to go while still enjoying the journey!